The Training Partnership is a vocational work provider for European students. The CRM Remedy Media built for them supports the business in many ways. The initial objective of the CRM was to report back to the partner (the client sending the students to England) on the performance of each students. This includes language training, the welfare of the students, work placements and the host family providing accommodation. 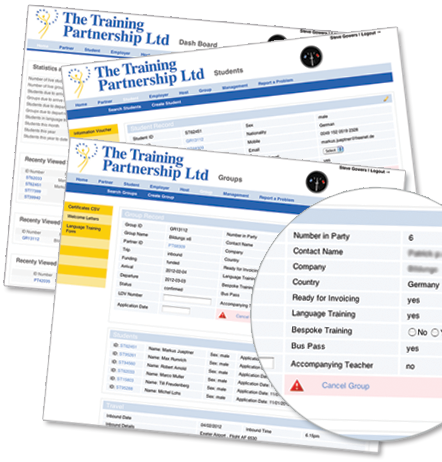 Our programming team develop bespoke CRM systems tailor-made for your business. Not all pre-designed systems can fit into your business work-flow, so we work to understand your business and what you need from a CRM. Small business can use spreadsheets or off-the-shelf CRMs until a certain point in their lives, but once a business grows beyond that, processes and systems need to be put into place to ensure data safety and availability. We develop systems that manage both customer and internal customer relationships, allowing your business to grow to it's next milestone. Not having processes in a business model can often be the downfall of a growing business. We learn all we can about your business - how it functions; who expedites; what challenges the business faces; the procurement; products and services; sales drivers and historic orders. We put all this information together and map out a storyboard for a CRM that can help your business. The fundamental role of a CRM is to record and display the results of your business. 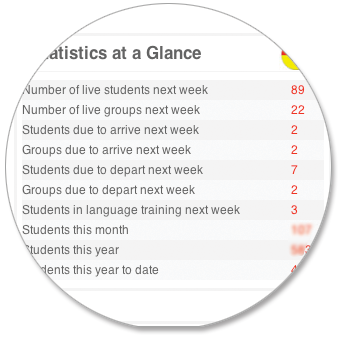 Our 'Statistics at a Glance' function gives employees motivation to meet targets set by management. Management can measure an employee's ability and work ethic by running reports of their work. All employees and management can see at a glance the performance of your business on a daily, weekly, monthly or annual basis.